When you’re planning a wedding, the music, flowers, invitations, and decorations may push everything else to the back of your mind. However, it’s important to have wedding ceremony programs so people know what to expect when they arrive for your special day. These can be as simple or as fancy as you want them to be, but there is some information that absolutely needs to be on them. First of all, you need to put the bridal party on your wedding ceremony programs. Whether you just have a few attendants or a whole bunch of them, it’s important to acknowledge them and give them the recognition they deserve. This doesn’t just include bridesmaids and ushers, either: you’ll want to list your officiant, parents of the bride, parents of the groom, and any other special guests at the ceremony, such as any one doing a reading or playing a song. The most important part of the program is the list of what is happening at the ceremony. 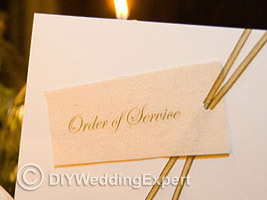 You’ll put the order in which things are done, and also any song selections or pieces of music that you are using for each part of the ceremony and who they are being performed by. You’ll also put items such as readings, a prayer, lighting of the unity candle, when you exchange your vows, and anything else that you might be doing during your ceremony. Though you don’t need a cover and can do it all on one simple sheet of paper, consider having a place to put the basic information such as your own names, the date, and the location. If you do decide to go with a program that has a cover, you can choose a picture or graphic that fits with your wedding theme, or add a quote that represents your marriage or romance. There are other things that you can add to the program as well, though you don’t want it to get too overcrowded. If you are doing any sort of cultural tradition or something that might not be well known to your guests, you may want to put a little explanation on the program as to what it is you are doing and what it means in your faith or culture. If you have room, such as on the back of thewedding ceremony program, you may even want to add directions to your reception hall, for those guests that aren’t familiar with the area.